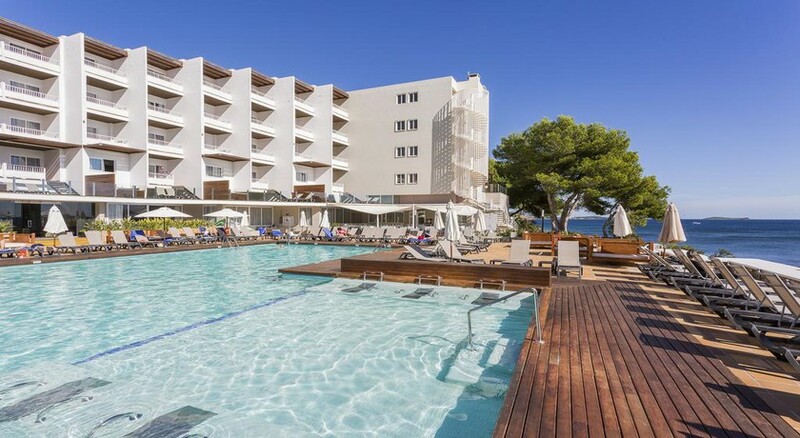 Palladium Hotel Don Carlos is a luxury adults-only beachfront property in Santa Eulalia, Ibiza, Spain. The property is located between lush green forest covered with pine trees and sea. The closest beach, is right outside the hotel. The hotel houses a beautiful outdoor swimming pool on its premises. The architecture and interiors of the resort have been inspired by the themes of Spain. The hotel offers 168 tastefully designed guestrooms which are equipped with amenities and facilities that ensure a luxurious and lavish stay for guests. The hotel is located 1.8km away from the town of Santa Eulalia, offering the guests an excellent opportunity to experience the life in Spain. This is a perfect destination for couples looking for a romantic holiday or friends for a great time. Palladium Hotel Don Carlos is located 20.3km away from the Ibiza Airport. The nearest beach is 150m away from the property. The town of Ibiza is located at a distance of 16.5km from the hotel and 1.8km away from the town of Santa Eulalia. Popular landmarks like Santa Eulalia Port, Nikki Beach Ibiza, Chirincana Beach Bar, Hippy Market Punta Arabi, Las Dalias Hippy Market, Sant Carles Church, Talamanca Beach, Pacha, Marina Botafoch, Dalt Vila, Ibiza Port, Privilege Ibiza, Amnesia Ibiza, Ushuaia Ibiza and the Es Paradis Ibiza are within a distance range of 18km from the hotel. Palladium Hotel Don Carlos has 168 tastefully decorated guest rooms which have been designed with utmost detail, incorporating architectural themes inspired by the Spanish motifs. The rooms are categorised into 4 types based on various aspects and amenities. Double Standard Room, Single Room, Preferential Room and Presidential Suite are the accommodation options on offer. The rooms are equipped with air conditioning control, telephone, quality bed linens, quality towels, balcony or terrace with outdoor furniture, electronic safe, coffee and tea maker, essential bath amenities, hair dryer, bathrobe and slippers. Palladium Hotel Don Carlos houses 2 restaurants and 2 bars that serve a wide range of international and local Spanish cuisines. Apart from that, the bars also serve a variety of local wines, beers, signature cocktails, alcoholic and non-alcoholic beverages. The hotel houses Bellavista Restaurant, Mar i Cel Restaurant, Pool Snack Bar and the Lounge Bar. The guests can also try local restaurants and bars at Santa Eulalia and Ibiza. Palladium Hotel Don Carlos houses a beautiful outdoor swimming pool which serves as an excellent option for recreational opportunities. There are live performances, movie nights, themed dinners and musical evenings organised regularly at the resort where the guests can enjoy to their fullest. The guests can indulge in activities like aerobics, live music performances, beach games, evening entertainment shows, diving, cycling tours, darts game, windsurfing, table tennis, billiards, gaming, golfing, etc. Nice & clean room. Good location and Hotel amenities. Fantastic entertainment. This was an amazing hotel, staff were extremely friendly and could not do enough for you and the food is the best we've ever experienced at a hotel, all fresh, continually replenished and spoilt for choice on the range of food I honestly think we were spoilt and will find it very hard to top this hotel.